I realize that I have been going on and on about the wines that were served at the Culinary Extravaganza 2015, but I have no choice. The selection was fantastic, compared to some of the years. Some years it felt like the wine distributors were just dumping slow moving wines onto the charity event, but this year with the MGM Grand underwriting the wine, not to mention having a table for food, the selection was grand (and pardon my wording). One would think that the wine distributors would want to showcase finer wines at an event like this, which would make their wares more desirable to the attendees, who might remember having a taste of the wines. The majority of the wines were in the twenty to thirty dollar range in retail and even more at the restaurant level. One of the other wine tables that I tended to frequent several times between the food tastings was the Italian wine table. I will mention with my tongue-in-cheek that there was not a fiascha or a jug in site. 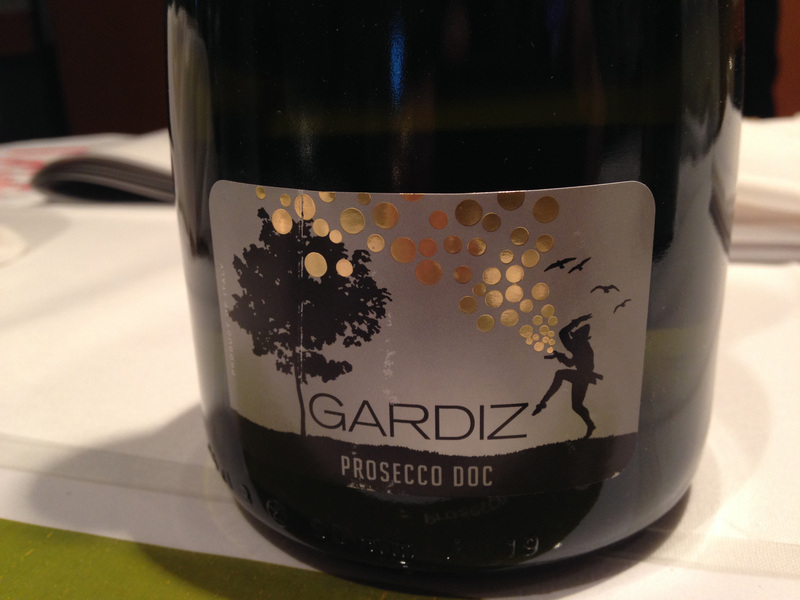 The first wine that we tried was the Gardiz Prosecco DOC NV, as my Bride is very partial to sparkling wines, because they are easy to drink and very understandable. This is just a popular type of wine, which keeps gaining in popularity. This wine from the Veneto region, because of the popularity has gone the extra step to rename the grape Prosecco, and wines of this nature not from the DOC area, must use the old name of the grape, which is Glera. 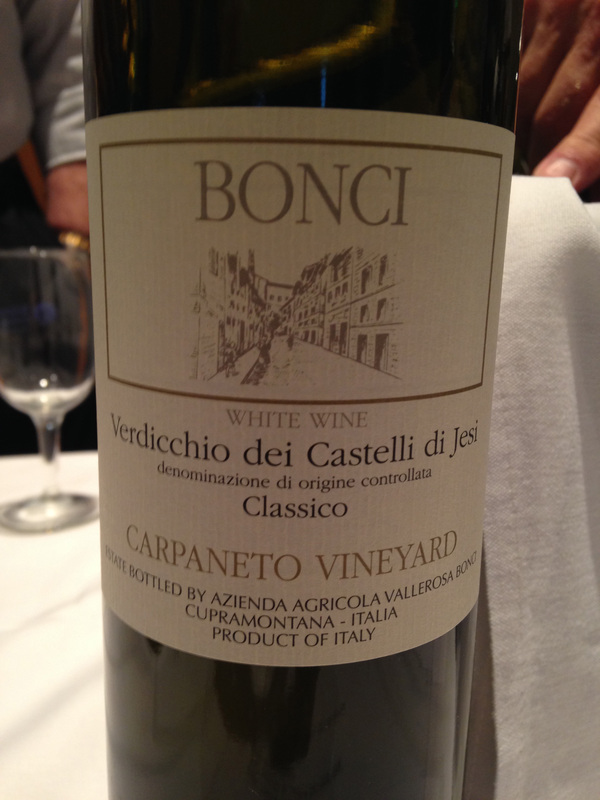 Another wine that I tried that is not often seen from the Marche region was the Bonci Verdicchio dei Castelli Di Jesi Classico Carpaneto Vineyard 2013. This is the oldest classic wine area of Jesi, the Verdicchio grape does wonderful there and the “Classico” means that it is another half percent higher alcohol proof by volume. 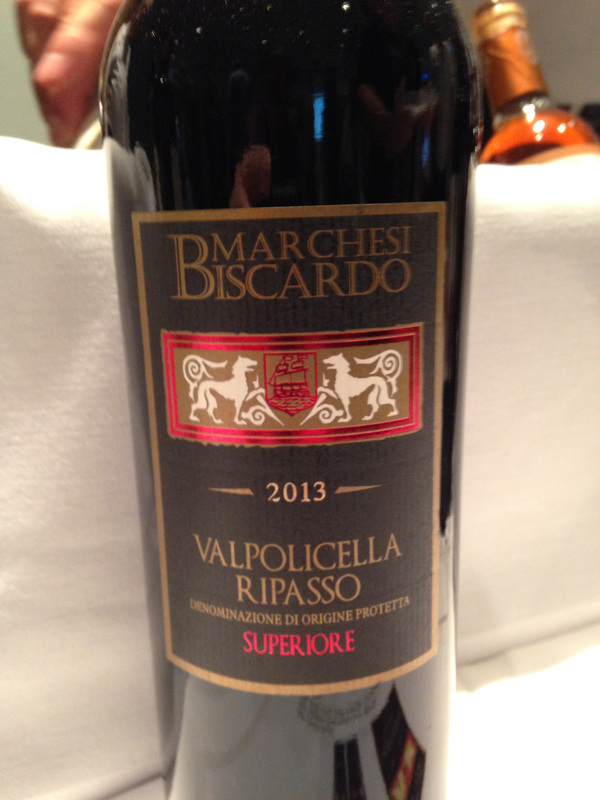 The next wine that I tried was the Marchesi Biscardo Valpolicella Ripasso Superiore 2013. Another wine from the Veneto, and I have enjoyed Valpolicella wines for at least forty years and I feel that the wines have increased in quality from the old days. This is the classic blending of Corvina, Rondinella and Molinara of the region and the Ripasso is the added step that is done to make the wine fuller and more nuanced. The wine is refermented using the tannin-rich skins of the grapes, which greatly enhances the taste of the wine. Then there were a couple of wines from the famed Tuscan region of Italy. 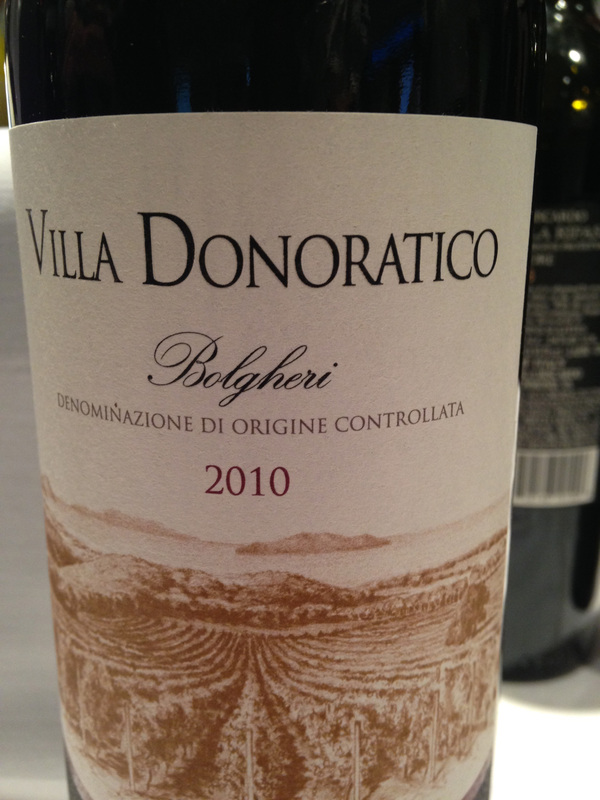 The first wine that I tried was Tenuta Argentiera Villa Donoratico Bolgheri 2010. Bolgheri now has its own DOC, as it was the grand experimental region that evolved into the famed “Super Tuscan” wines. This wine is a blend of Cabernet Sauvignon, Cabernet Franc and Merlot, all stellar grapes that are not really native to the area. The other Tuscan wine was Buonamico Cercatoja Toscana IGT 2010 which is using the Toscana IGT designation, because once again, some of the grapes are not local. While the wine is made using Sangiovese, the work-horse of Tuscany, it is blended with Syrah, Cabernet Sauvignon and Merlot to create a mellower flavored wine from the region. Finally for the last of the reds of from Italy was a bow to the new emerging wine market. The wine was Drei Dona Tenuta la Palazza Magnificat Cabernet Sauvignon 2008. A finely made and mellow Cabernet Sauvignon from the Emilia-Romagna region of Italy, which is not known for Cabs, but the world, knows Cabs. The last wine that I will discuss from the Italian table was a delightful dessert wine that was new to me, and most enjoyable, as it reminded me of a Sherry, which I enjoy so much, but my Bride is not partial to. 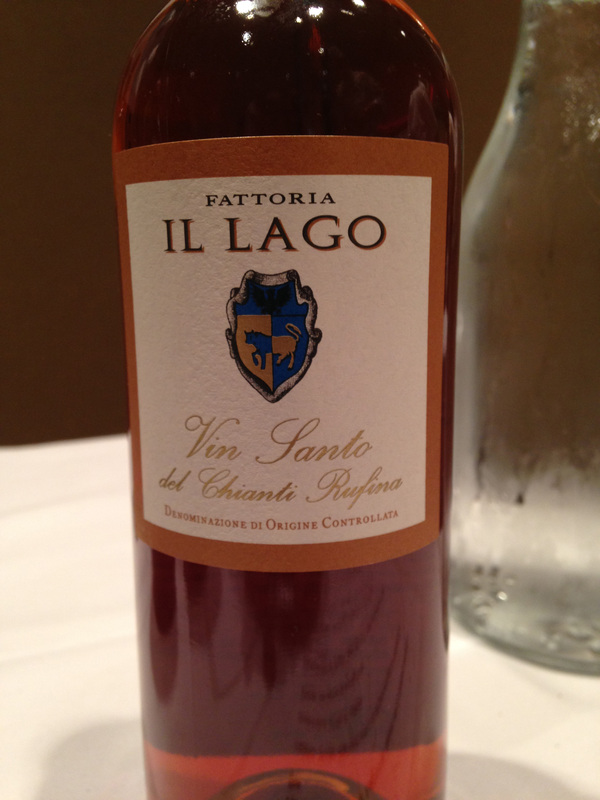 There were a couple of bottles of Fattoria Il Lago Vin Santo del Chianti Rufina. This amber colored dessert wine is from Tuscany and since 1997 has its own DOC. The wine is made from Trebbiano and Malvasia grapes and Vin Santo means “Holy Wine,” but I would not call it a “Communion” wine. It is of the group of wines called “straw wines” as the grapes are left out on straw mats after harvesting to dry for three to six months under the Tuscan sun. Then they are gently pressed, then fermented in small barrels that are completely sealed for three to ten years. This unique approach for wines of this area, gives the wine a slight oxidation taste, which as I stated earlier reminded me of a Sherry. I guess as I have mellowed I appreciate the dessert wines more and more. This entry was posted in Dining, Wine and tagged Bolgheri, Bonci, Buonamico Cercatoja, Cabernet Franc, Cabernet Sauvignon, Corvina, Drei Dona Tenuta la Palazza Magnificat, Emila-Romagna, Fattoria Il Lago, Gardiz, Glera, Italy, Malvasia Bianca, Marchesi Biscardo, Merlot, Molinara, Prosecco, Ripasso, Rondinella, Straw Wine, Super Tuscan, Syrah, Tenuta Argentiera, Toscana IGT, Trebbiano, Tuscany, Valpolicella, Veneto, Verdicchio, Verdicchio dei Castelli Di Jesi, Villa Donoratico, Vin Santo del Chianti Rufina. Bookmark the permalink.